Kayla Aolick got her life back after being paired with a seizure guide dog. Now she’s helping others find the same freedom. Apr. 22, 2015 6:00 a.m.
Kayla Aolick views the day she saw her Shadow as the day she gained her independence. Aolick has multiple seizures thanks to the after-effects of a brain tumour she had removed when she was younger. Shadow is her dog guide, and he is able to alert Aolick before she has a seizure, or alert someone nearby to get help for her. More importantly, having Shadow by her side means Aolick is able to go about life without having someone watching her every step. “I still have a lot of independence now. I go to a cooking group on Mondays and I don’t have to drag my mom with me. I can go just with him,” Aolick says. Life has been a lot better since the Lions Foundation of Canada paired Aolick with Shadow, a five-year-old golden retriever, she said. She attributes being less stressed now that she has Shadow, as well as the fact he can alert her before she has a seizure so she can take medication to calm down. “He detects them before they happen,” Aolick explained. Shadow is not the only dog guide from the Lions Foundation of Canada assisting people in the Alberni Valley: there are at least three other dogs from the same foundation helping children who have autism, Aolick said. 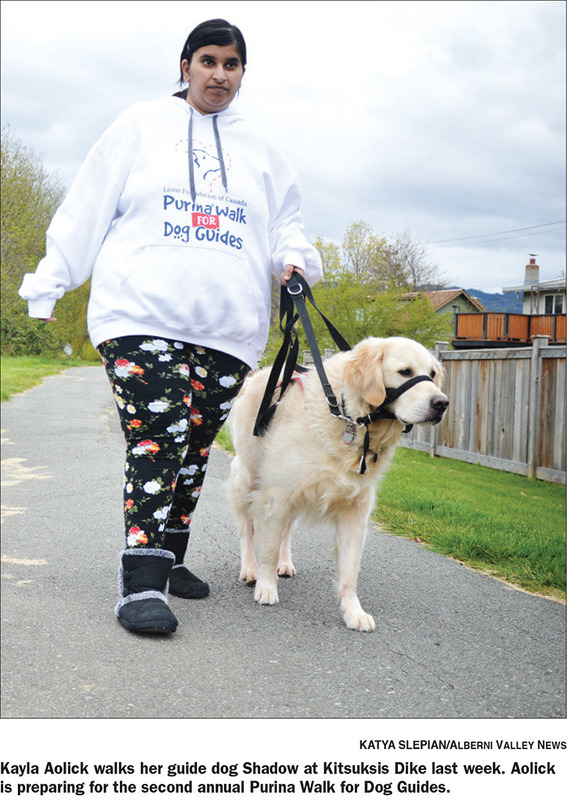 Aolick and her mother Sheila are giving back to the foundation by organizing the second annual Purina Walk for Dog Guides at Blair Park in Port Alberni on Sunday, May 31 at 1 p.m. (registration is at 12:15 p.m.). Last year the pair raised $4,800 and this year Kayla said she would like to raise more than $5,000. The walk takes place in more than 200 communities in Canada (the closest to Port Alberni is in Nanaimo) and 100 per cent of the money raised goes toward the six dog guide programs. The Lions Foundation of Canada gives Canadians a new “leash” on life by providing dog guides to people dealing with a variety of challenges. There are canine vision, hearing ear, seizure response, autism assistance, diabetic alert and service dogs. When Kayla Aolick was chosen to receive a dog guide, she spent three weeks in Ontario training with Shadow. The length of time a client trains with their dog guide is different, but all the programs are expensive to run, she said. For more information or to register for the Purina Walk for Dog Guides, or if you are interested in helping sponsor the walk, please call Sheila Aolick at 250-720-1062 or the Lions Club of Port Alberni at 250-724-3393.